TGIT up in here. Today we have a super duper long time favorite of mine, Sarah from Matters of Style. 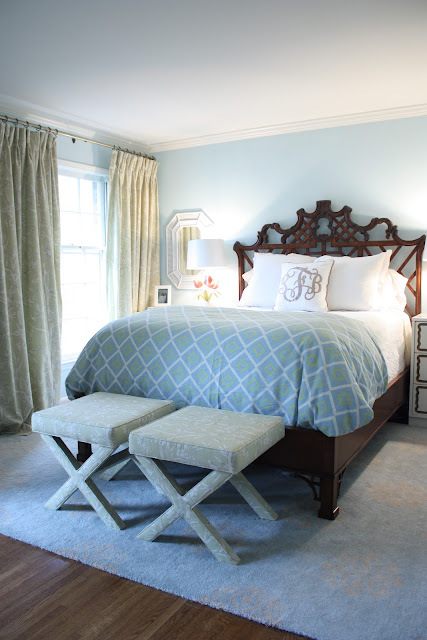 She will be sharing her all time favorite room, her master bedroom. I don't know if it is the lack of coffee or my desperate need for a weekend but I totally want to take a nap in here, now. It is so serene and so peaceful. 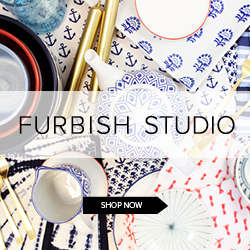 In addition to Sarah's fabulous designs and style, she also has a shop on her site where she sells one of a kind pieces. Every time I log on to her site I am severely tempted by her treasures. Just call me a gypsy. Anyway! So excited to have one of my long time favorites share her space. Take it away Sarah! Hi!! It’s Sarah from Matters of Style! 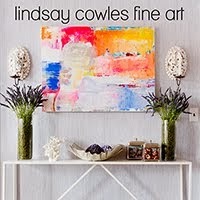 Lindsay is one of my favorite bloggers- I first fell in love with Sadie + Stella when I read about Lindsay finding a fabulous coral spray paint color. To this day, I am constantly inspired by her creativity and love of color. 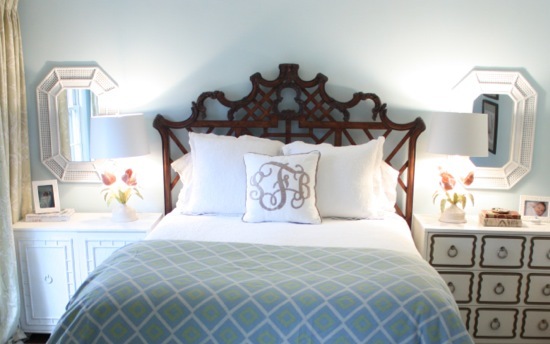 I am delighted to be here on Sadie + Stella today, sharing my master bedroom with you. Like every room in my house, it is always a work in progress. When I chose colors for our bedroom, I knew I wanted it to be serene and peaceful with a touch of glamour. I read somewhere that you sleep better in a clean bedroom with a soothing color palette, and I think it is true. I always love blues and greens, so the modern geometric fabric from Thibaut on my duvet cover sets the color palette for the bedroom. On the curtains and the x-benches, I used a green bird and bamboo fabric. The x-benches are from Ballard Designs and are such a good value- $179 each, and you can send them your own material. As much as I would have loved vintage X benches, they couldn’t compete with this price. The benches make a great place to sit to put on my shoes (or a place to pile clothes, let’s be honest). The white Dorothy Draper Espana chest is an eBay find. I actually drove to the other side of Asheville to pick it up, because I didn’t trust the shippers not to damage it. It is one of my all-time favorite pieces of furniture. I chose a dresser in a light color to balance out the darker-toned headboard. 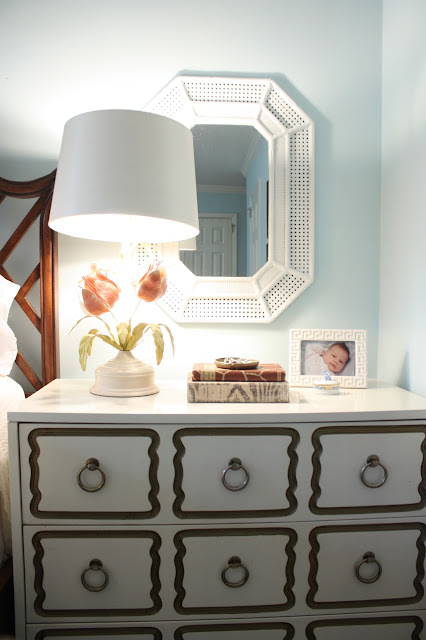 I also have a white faux bamboo dresser on the other side of the bed- its proportions compliment the Draper chest, so it makes the space feel unified and symmetrical even though the dressers aren’t a matching pair. I was debating whether or not to do an upholstered headboard when I stumbled upon this Chinese Chippendale style bed from Century. It is a unique statement piece, and it really anchors the room. It is mahogany and has fretwork detailing on the headboard and legs. I decided not to use a bedskirt with it, since the legs have such fabulous fretwork details. 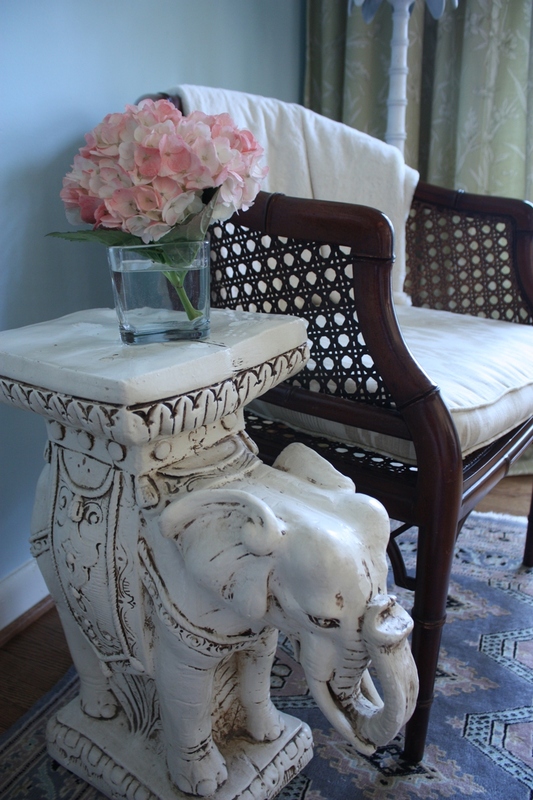 The rug is light blue wool with ivory medallions from Safavieh. I generally go as large as possible with rugs, as larger rugs make a room feel spacious and cohesive. It is so nice to have a seating area in a bedroom. I used an antique Persian rug from my grandparents to create the feeling of a separate area in the room. Since this photo was taken, I have added an upholstered armchair, so it's a nice place to sit with a book. For lighting, I have a pair of coral vintage tole tulip lamps. A dear friend found them for me at Scott’s. They are so glamorous and feminine and perfect for a bedroom. If there is one room in the house that can be more feminine than the rest, it is the master bedroom. 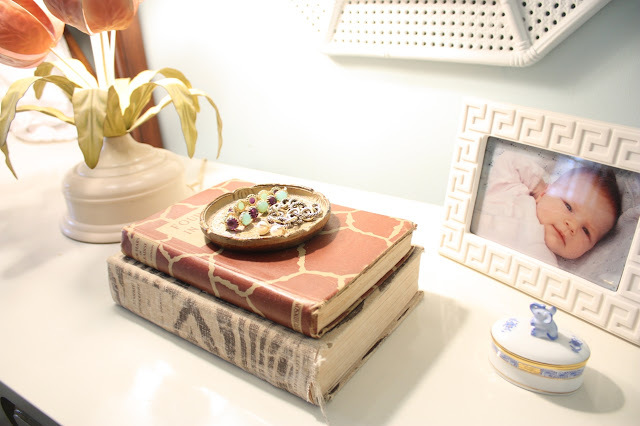 On my nightstands you will find my everyday jewelry in a Florentine tray, pictures of my babies, Beckett and Sally, and some Herend pretties. So now you have seen where I lay my head each night! Lindsay, thank you so much for having me! I am so honored to be able to share my home with your readers! This looks simply luxurious...thanks for sharing. Love MOS! OK, let's just say it...we are all jealous of that bed. Great room. Absolutely gorgeous!! 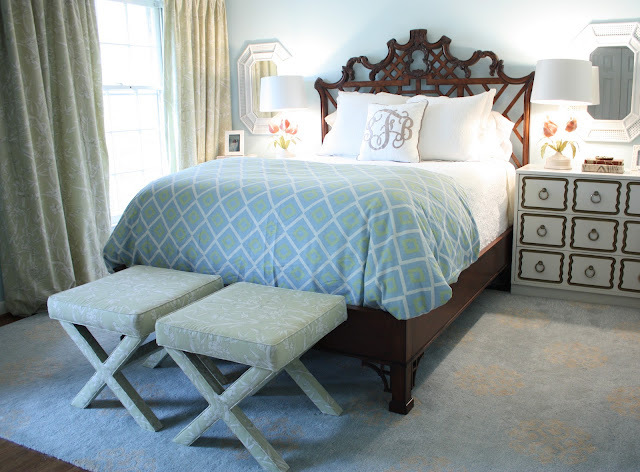 You did such a fabulous job, love the bed, the bedding, the chests, the colors...well everything! I love Sarah! So fun to see her room! I'm dying over the eBay chest score! And I might just have to copy and do those benches! Gorgeous bedroom! Beautiful room. Love the statement bed! completely agree! 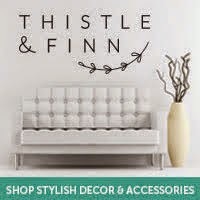 and that headboard is ah-maze!!! Wow! This is one of my favorite bedrooms I have seen in a long time! 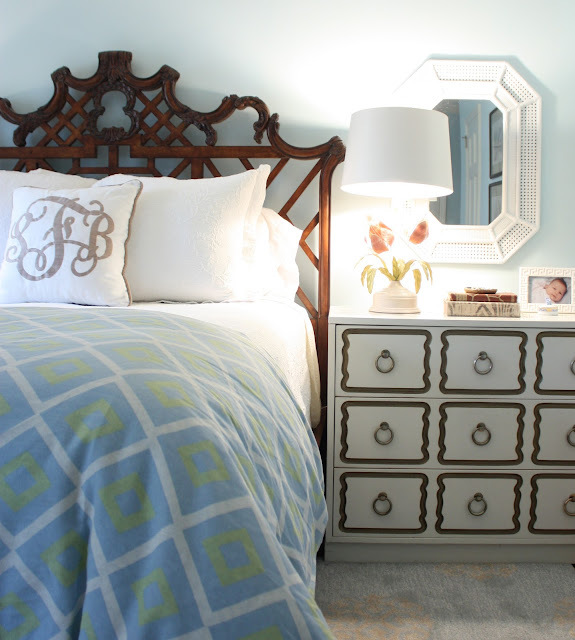 Sarah has such great taste- this bedroom is gorgeous! And I love your blog, too! sarah - its beautiful! i love your choices! Love MOS and thank you for bringing her bedroom to us! I would love to crawl under that Thibaut duvet!! Scrumptious! A beautiful space Sarah! I love your bedside dressers! I love MoS, and her bedroom is fabulous! That bed is AMAZING! Beyond gorgeous! what a beautiful bedroom!! that headboard takes my breath away!